According to reports, Wenger has made his first signing of the summer transfer window, he's a player playing with Argentinian side Velez Sarsfield..... the player that it's being touted to move to the Gunners is 23 year old midfielder, Ricky Alvarez. The report states that he's a versatile midfielder, who can also play in the hole, behind the striker. He is blessed with great pace and a powerful shot, and has been excellent this season with the club. He's 6'2'' which shows that he's physically well-built, from clips I've seen from him on Youtube and other sites.... Ricky Alvarez is a talented player. Ricky Alvarez will come on a free transfer and it will be made official at the end of the Argentine Clausura campaign.... supposedly, nothing is official yet. Ricky Alvarez.... Wenger's first summer signing? What do you think? Is Ricardo Alvarez a suitable signing for the Gunners? Does it show Wenger's intent on ending Arsenal's trophyless reign? Please share your thoughts and opinions. Arsenal Breaking News: It's official.... Denilson is leaving! This is breaking news as Denilson has confirmed that he is leaving the Gunners, citing lack of trophies and success as the reason, that "he made up his mind 8 months ago", and that Wenger accepted his transfer request. Well, personally I'm relieved that he is leaving, he has been poor this season and I never felt that he would make it in the Premier League. What angers me the most, is that he doesn't blame himself or own up that his poor performances are one of the reasons why "the club drop silly points in stupid games." He's one of the worst players to wear the Arsenal shirt in 10 years and has been a liability whenever he plays. What do you think? Do you want Denilson to leave? Arsenal Transfer Gossip: Blackburn skipper Christopher Samba.... is he good enough to be a Gunner? This player has been linked numerous times and constantly for the past year or so, to a move to the Gunners. This player was tipped to move in January, but didn't happen. The player that I'm talking about, is again heavily linked to move to the Gunners. 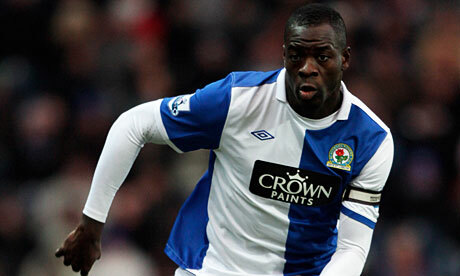 The player I'm talking about is Blackburn centerback and skipper, Congolese international Christopher Samba. 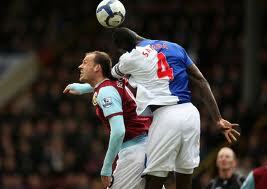 Christopher Samba is a Congolese international born in France, on March 28, 1984 in the city of Creteil. Samba is known for his toughness, aggressiveness, his physical capabilities, and aerial ability (he stands at 6'4'' tall), as well as possessing leadership qualities shown by him becoming the captain of Blackburn. He started his career with lowly French side FC Rouen before leaving to Sedan, where he played 4 times with the regular side and 26 times with the reserves. 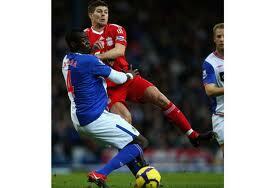 He left to Germany, joining Hertha Berlin in 2004, where he struggled to get playing time. Samba made 28 appearances with the reserves and 20 appearances with the first team in 3 years with the club. It is at Blackburn, where he finally began to show his ability, then coach Mark Hughes gave him his chance, when he offered him 5 day trial with the club and later signed for Blackburn for around 450,000 pounds in January 2007. Samba has turned into one of the most consistent and reliable centerbacks in the league, putting in notable performances, his last against the Gunners in the 0-0 draw at the Emirates which is probably the main reason, Arsenal fans want to see him as a Gunner next season. He has made 165 appearances so far with the Rovers, scoring 16 goals. Christopher Samba is valued by the press at around 12 million pounds, which I believe is a ridiculous and over-hyped value, I don't think he's worth near that at all, along with another heavily-linked defender in Gary Cahill who is rated at 15 million pounds (that is the same Giorgio Chiellini's value, who is a proven, world class defender), which just shows how over-hyped Premier League players are. I believe there are better centerbacks at more reasonable prices like Mamadou Sakho, Giorgio Chiellini, Cristian Zapata, just to name a few. In my opinion, Samba's value is in the 6-8 million pound range and other than the Gunners, he has been linked to Tottenham, Manchester City, Aston Villa and various other clubs around Europe. 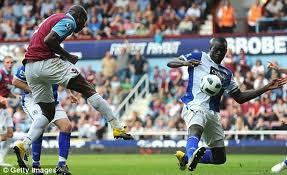 Christopher Samba.... is he good enough to be a Gunner? What do you think? Is Samba good enough for Arsenal? Is he overrated? Is he overvalued? Should Wenger sign him?